Over a week back stateside and between jet lag and the start of a new semester I’m still not even halfway through this chronicle. It’s getting a bit harder to sort out the details, but I’ll do my best. Kannimara. Possibly the oldest and largest teak tree in the world, spared from felling by allegedly spurting blood. The second day of sampling at Parambikulam is practically stress-free. 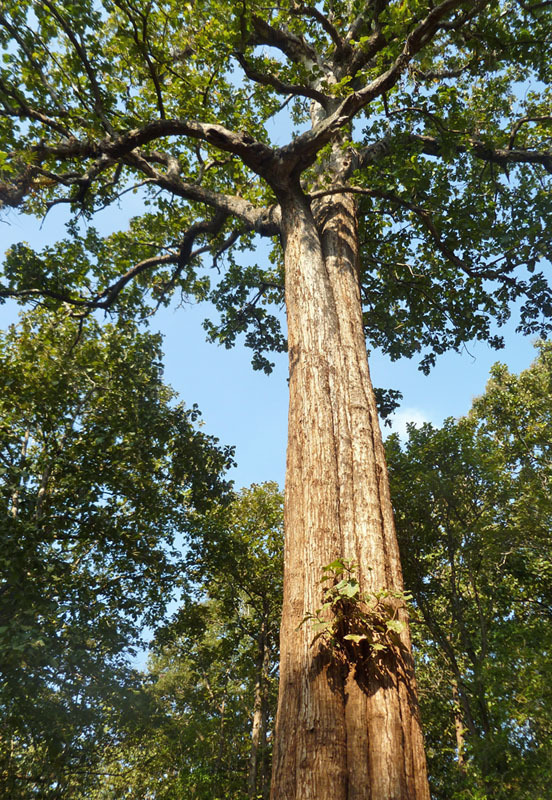 We get a decently early start on the morning’s collection but squeeze in a visit to the Kannimara, one of the largest teak trees in Asia and recognized with the Mahavriksha Puraskar (Giant Tree Award). This aboriginal tree is said to have escaped felling because it spurted blood when initially struck by the axe (or whatever tool was used), and it has since been worshipped as the “virgin tree” (roughly the translation of “Kannimara”). I’m left to presume that all of the other teak trees from Kannimara’s vintage were taken down for being less sanguine in xylem, and therefore all of the standing teaks we see today (all much smaller) are secondary growths from replantings and natural propagation from the replanted stock. Etroplus. The presence of native cichlids on the Indian subcontinent reminds us that this land mass broke off from the southeast coast of Africa–where these fishes’ closest relatives are centered–less than 100 million years ago. Our first sampling of the day takes us out onto a stream in a different part of the reserve as yesterday, though the fish we sample are quite the same as what we have been collecting. Then we make two short stops before making our way to a sampling site that would turn out to be the most perfect of the places I visited on this trip. One of the spots was on Turnakadavar Lake near the inflow from a water tunnel coming from another reservoir over 2.6 km distant. In the development of a reservoir project, it’s a common practice here to connect different watersheds with tunnels. Within the boundaries of Parambikulam Tiger Reserve there are two reservoirs, Turnakadavar and Parambikulam, that are linked by this tunnel. 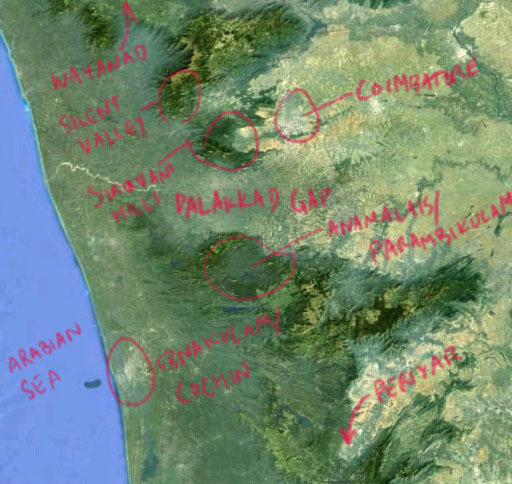 I’m not entirely sure about the rationale for connecting these two watersheds, but I suspect that Turnakadavar is closer to the Palakkad Gap and is just a stop on the route connecting the larger water source of Parambikulam Lake to population centers like the city of Pollachi. Two species of mahseer. The one on the bottom has a more protruding mouth as well as a long barbel under its chin. 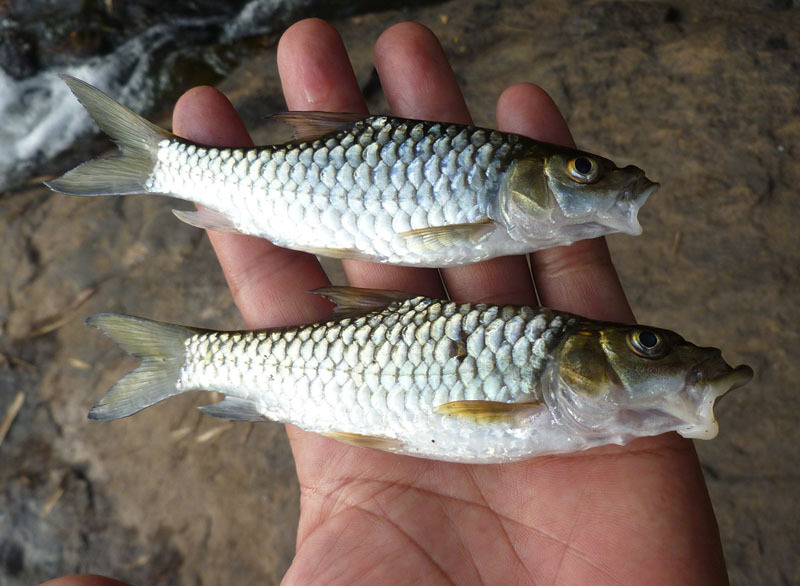 These two are small, but mahseer grow large (some species to 20 kg) and were targeted by sport anglers during the period of British rule. At Siruvani Lake—on the shores of which we stayed at Patiyar—there is a tunnel that carries reservoir water under Siruvani Mountain to the Tamil Nadu side where it serves as one of the important sources of domestic water for Coimbatore city. Water that would normally drain to the Arabian Sea on the Kerala side of the Ghats is being sent under the divide and into a watershed that normally drains into the Bay of Bengal. From the standpoint of supporting the needs of humanity, this type of alteration to the hydrology is perfectly sensible. The Tamil Nadu side is more arid being in the rain shadow of the Western Ghats, and so if you can send water from the Kerala side where it is more abundant under the mountains to Tamil Nadu, well that just seems like a great idea. The “middle stretch” of the Western Ghats. The part I visited extended from Periyar (just out of view to the south) to Wayanad (just out of view to the north). The Western Ghats ecosystem actually extends across the strait and onto Sri Lanka in the south and northwards through the state of Karnataka and into Maharashtra. From the standpoint of conservation, this is a disaster. 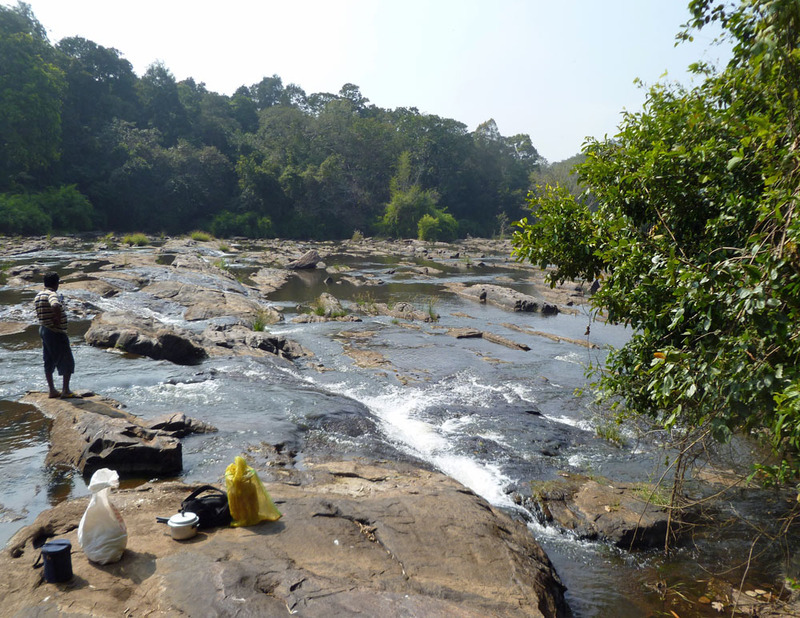 On paper, the topography of the Western Ghats seems ideal for the study of species originations, particularly for the small hillstream fishes that we are sampling. On the Kerala side, there are a handful of distinct, major watersheds that drain directly into the Arabian Sea. On the Tamil Nadu side, almost all of the water flows into the Bhavani River, which joins the Cauvery River that empties into the Bay of Bengal to the east. Each watershed has dozens to hundreds of tributaries, many of which have perennial flow, thanks to the area’s climate and geology: two seasons of monsoon (and therefore no dry period of extreme duration) and impermeable bedrock underlying the red clay soils—i.e., plenty of water percolating through the soil and re-emerging when it hits the bedrock. As we were preparing lunch, someone noticed a large snake crossing the river and heading directly toward our site–either a king cobra or a sarapan (black rat snake). It ducked into a crevice in the bedrock, but nobody wanted to get too close to make the definitive ID. Many of the hillstream fishes are adapted to small flows near the headwaters, and thus it may be unlikely if not impossible for them to migrate down to confluences with other drainages and then back up to the headwater habitats that they prefer. It’s reasonable enough to predict that these hillstream fish populations are genetically isolated from other similar fish populations, and this is precisely the condition of allopatry that leads to the eventual evolution of species differences between what are initially different populations of the same species. This type of geography strongly favors new species originations in a way that doesn’t happen in oceanic fishes, and it is for this reason that the majority of fish species in the world live in fresh water, despite the fact that their available habitat is not even a thousandth of what is available to saltwater fishes. The Western Ghats should be an ideal place to study the process of the origin of new species through allopatric speciation… if it were not for its long history of human disturbance. This is as close as I wanted to get. It turned out to be just the harmless colubrid. Darn. But “absence of human disturbance” does not really exist in the Western Ghats. Even the deepest and most remote spots have all been touched by more human feet than tiger paws—this much is certain, but what is more difficult to estimate is how profound a mark has been left behind by the human traffic. For the hillstream fishes, the alteration of the hydrology have likely resulted in some gene flow between watersheds that would otherwise not be possible—migrations through tunnels or reservoirs are likely to have disrupted the process of speciation. To make matters worse, many of these fishes native to Indian hill streams are popular among aquarium hobbyists worldwide, and the value of rare and novelty species has generated a sizable commerce of fishes caught from the wild. This will have impacted the genetic structure of hillstream fish populations as collectors will have attempted to establish breeding populations of more valuable species in areas where they are not native. It is also entirely true that the vast majority of fish habitat in the hills of southern India has been lost to development for human use, and its water has been diverted into irrigation systems to serve tea plantations, rice paddies, and other croplands—resulting in unknowable extinctions of native and endemic species of fishes as well as other stream-dependent invertebrates and plants. All of this has been (an overly long) preamble or sidebar to a story emerging from one of the documents that we picked up from our chats with officials the previous morning. 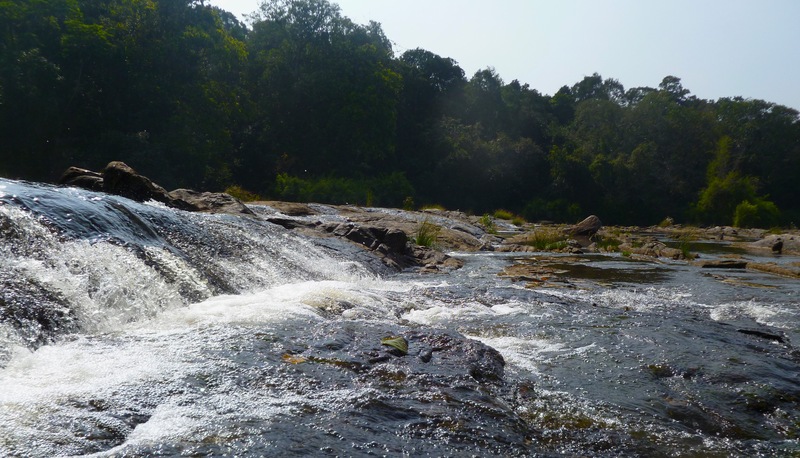 A new hydroelectric project is being planned for the Chalakudy River downstream from where we sampled in Parambikulam, and if the project goes through, an extensive area in the buffer zone southwest of the reserve would be flooded. 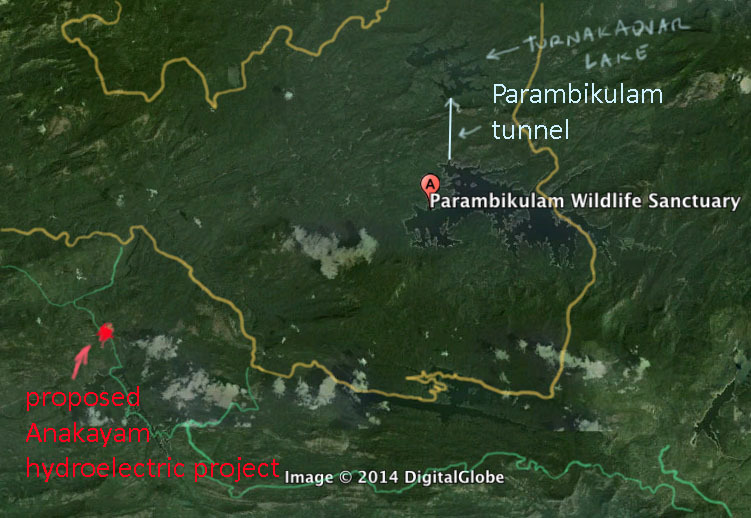 The reservoir would not extend into the core area of the Parambikulam reserve, as that would break the rules prohibiting human exploitation within designated areas of critical tiger habitat… but it would come very close. Make-shift wood stove using the natural crevices of the local geology (basaltic bedrock, I think). Dr. Mani starts the preparation of a fresh sambar with the boiling of toori dal (medium-size yellow lentils). As I mentioned before, our third collection site of the day is remarkable for its beauty. 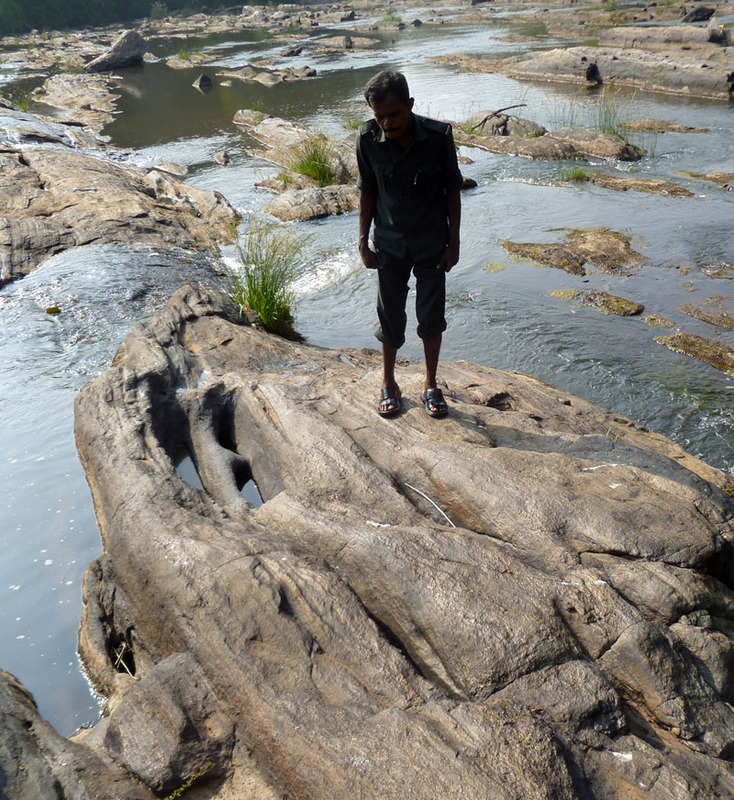 Our river—which is either the Chalakudy or a major tributary—weaves its way over a stream bed of rippled and contorted basalt and forming a vast spread of pools and mini cascades. This habitat supports big fish and little fish, frogs and snakes, birds and all of the mammal species that can be found in southern India. It’s highly protected but still subject to fish harvesting by tribals (as well as researchers). But sitting on a boulder in the middle of this stream bed, which is in the middle of the largest tract of protected forest that we have seen, I am about as distant as anyone can be from humanity—at least in the southern stretches of this very populous country. 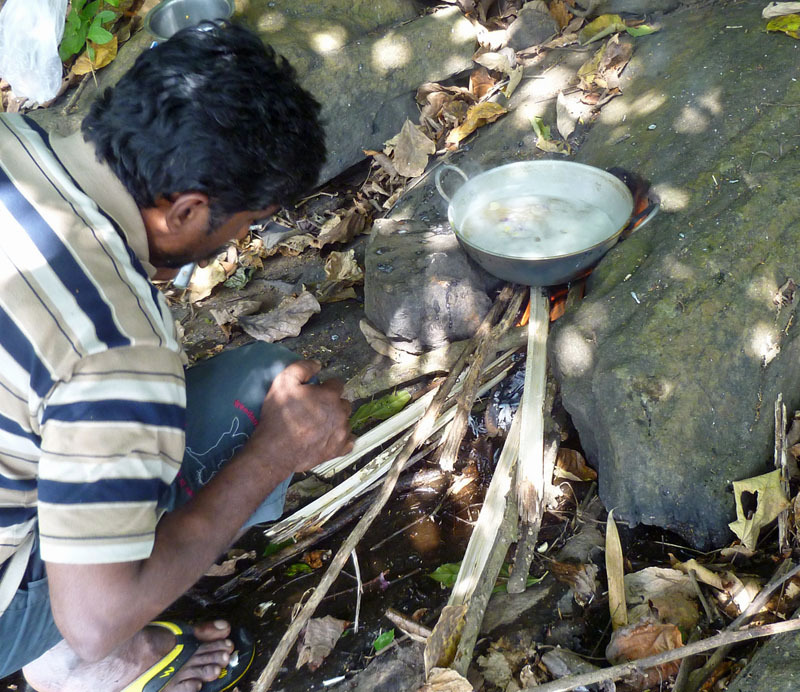 Dr. Mani set up a make-shift wood-fire stove on the bank under the streamside trees, and we cooked sambar and fish (a Puntius carnaticus and several larger Garra)—rice, too, but we used the gas burner for that. 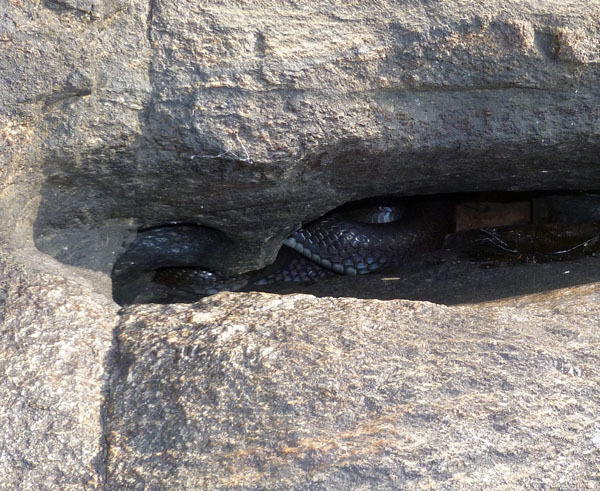 There was a period of tenuous curiosity when a large snake—either a king cobra or a black rat snake (Pytius mycosa)—holed up in a crevice near our lunching site—it turned out to be a rat snake. 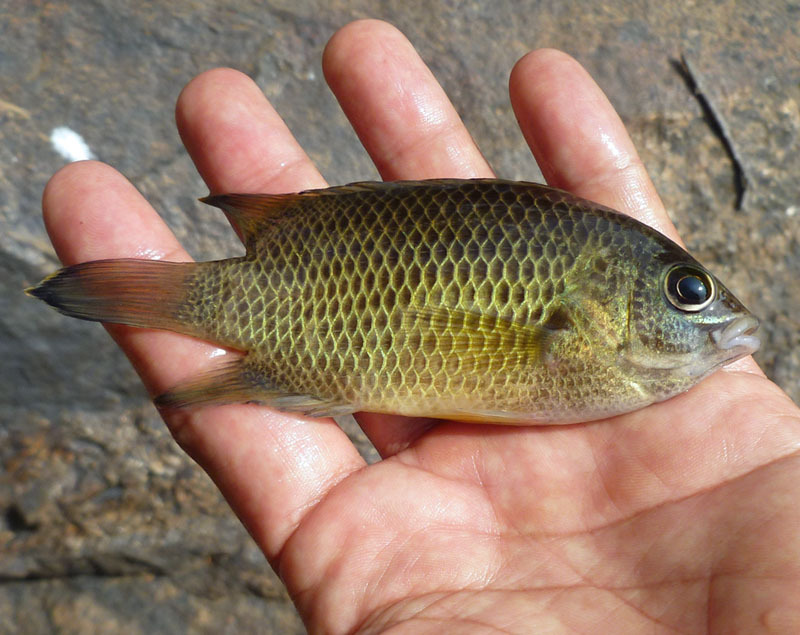 We caught our first native cichlid (genus Etroplus), as well as two species of mahseer. It was a great afternoon at a great site and is the spot I hold in memory as my locus amoenus in India. I will be saddened when the rare remoteness of this location is sacrificed with the impoundment of the Chalakudy and creation of a reservoir just a mile downstream from here.